As my recurring Achievement in Voice Acting award indicates, I have a great deal of appreciation for the casting on BoJack Horseman. In an arena where there’s plenty of competition—Adventure Time, Bob’s Burgers, Archer, Steven Universe, Rick And Morty—it’s possible to stake the position that BoJack is the best-cast animated series currently on the air. Between a core ensemble arguably doing the best work of their already impressive careers, its gift for fleshing out new characters, and its ability to get celebrities to play hilariously exaggerated versions of themselves (Naomi Watts, Daniel Radcliffe, Henry Winker, Character Actress Margo Martindale), the talent of this show is on point. That strength of the show is vividly on display in “Old Acquaintance,” but in an odd way that works to the episode’s detriment. It brings back a huge cross-section of the show’s best recurring characters—Ben Schwartz, Kristin Chenoweth, Maria Bamford, Adam Conover, and Kristen Schaal to name a few—and adds none other than “Weird” Al Yankovic to the ensemble, and yet it’s not the Traveling Wilburys supergroup episode that you’d expect from this confluence of talent. Instead, it feels like it gives everyone their material and then steps back, producing an episode too busy for its own good with different projects and plot points. Unfortunately, “Old Acquaintance” largely keeps the two camps separate, save one phone call between Princess Carolyn and Vanessa that’s equal parts sparring and gloating. It instead opts for the two groups to operate through surrogates, be it Princess Carolyn meeting up with her old assistant Laura or Vanessa and Rutabega trying to sabotage BoJack by offering him a new Kelsey project. As good as it is to have Rachel Bloom and Maria Bamford back in some capacity—particularly the latter after a silent reappearance in “Fish Out Of Water”—it has a disconnected, strategic nature that isn’t as satisfying as the personal conflicts that we know exist between these agencies. It lacks the energy of the similar sparring between Princess Carolyn and Vanessa in season one’s “Say Anything,” even with heightened circumstances: the constant thunderstorms as it alternates between offices and the ticking clock to midnight for these deals to close. What truly lands in this Jenga tower of deals and double deals is the final piece that Vanessa’s able to pull out—an email from Princess Carolyn keeping Laura on the assistant track because she was too good to lose. 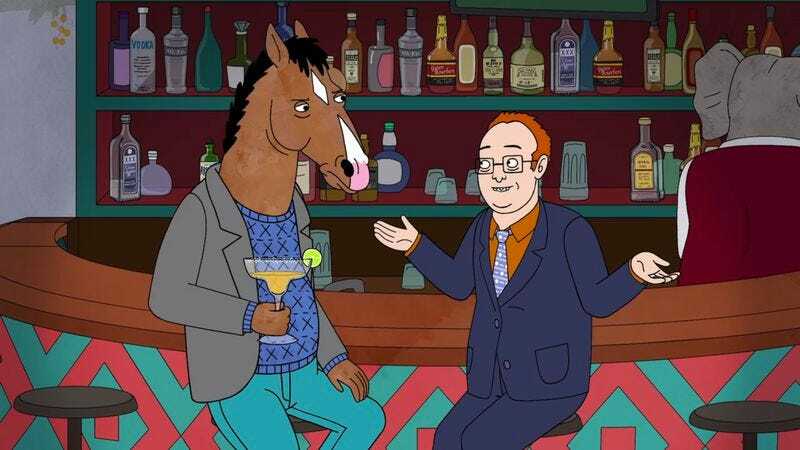 That’s the personal connection that the deals were missing, and it cuts even deeper coming only a few episodes after “The BoJack Horseman Show” where we saw how long Princess Carolyn was trapped in a similar position. Between that email and aggressive negotiations over BoJack’s salary, she costs her company both deals, adding more fuel to the idea that her goal of running this agency single-handedly is too much for her. 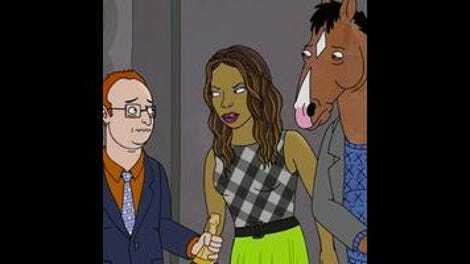 The byzantine negotiations of Hollywoo stand in stark contrast to the Labrador Peninsula as Mr. Peanutbutter and Diane decide to get out of town for the holidays. Establishing the real-world Labrador Peninsula as being a literal location for Labradors is a clever move on the BoJack creative team’s part, and it’s interesting to learn that Mr. Peanutbutter’s exuberance is as much a racial ability as it is a personal trait. The entire peninsula is a bucolic scene with the attitude of a place where nothing bad ever happens, full of dogs free to throw and fetch their own Frisbees, and roughhouse with their brothers in the airport parking lot up to and including a roll into traffic. Speaking of which, casting Mr. Peanutbutter’s brother Captain Peanutbutter with beloved parody songwriter “Weird Al” Yankovic is in the top ten of the most brilliant casting moves that BoJack has ever pulled off. As expected, Yankovic is entirely at home delivering the sort of chipper behavior we’ve come to expect from Mr. Peanutbutter, and he and Tompkins matching each others energy level is a delight to witness. But what’s not expected is that Yankovic can pivot to drama as easily as he does, speaking in loaded terms that takes Diane aback. (“The kind of stuff you’d hear in a sad Creed song. Or a happy Elliot Smith song.”) It turns out that he’s got a twisted spleen, and there’s more than a chance he won’t be okay afterwards, news Mr. Peanutbutter doesn’t take well. All the stuff going on Labrador Island is sturdy, but when juxtaposed with the business of Hollywoo, it makes “Old Acquaintance” feel like an episode being pulled in two different directions. Sometimes when BoJack splits its narrative, the balance between serious and silly works to keep the show on an even keel. Here, the business negotiations and family drama don’t strike the balance the way it’s capable of at its best, and investment in one is broken up by cutting away to the next. Overall, “Old Acquaintance” feels like an episode where the main goal is to generate more drama for the season’s third act, and while it doesn’t land with the resonance of some prior installments it does succeed in that. BoJack loses two potentially great projects—and whatever chance he had of making up with Kelsey—and silently participates in the third by not butting into Ana’s ruthless destruction of Bradley. (A moment that’s easily Angela Bassett’s most glorious line read this season.) Princess Carolyn’s looking into an uncertain financial future where her agency’s close to blowing like the fireworks she watches at the end, and that’s even without the knowledge that Judah met with Admiral Charley Witherspoon behind her back to discuss a potential merger. And Mr. Peanutbutter has to finally acknowledge that bad things can happen on Labrador Island, and even with the support of his wife, they can’t be made right with just a smile. In a dark twist, the happy ending is reserved for the people who are ostensibly the villains of this story: Rutabega manages to be present for the birth of his multiple children and Vanessa gets to bring them the news that she saved the agency. But then again, Vanessa and Rutabega have an advantage in being happy: they’re not a main character in the BoJack Horseman story. Achievement in Voice Acting: This could be a general ensemble award this week, but Captain Peanutbutter takes the prize as we need to recognize how wonderful it is that there exists a television show that allows “Weird” Al Yankovic and Paul F. Tompkins to play brothers who also happen be giant talking dogs. With Emily’s steady hand no longer on the wheel, Cabradabra is now subject to Todd’s strange whims and Mr. Peanutbutter’s enabling of said whims. First he decides that providing a safe space should be extended from women to men, then he decides that they need to support their clientele who want a more “bangable” base of drivers, which means hiring from the Whale World pool. Two great Todd callback details: he’s recycled the Halloween store pie chart to track harassment claims and his Disneyland owner jacket as Cabracabra CEO. Also, his tone to BoJack about Emily leaving clears up any doubts that he doesn’t know exactly what his roommate did.